This song was largely unknown outside of Shaker communities until it became world famous thanks to its use in Aaron Copland's score for Martha Graham's ballet, Appalachian Spring, first performed in 1944. Copland used “Simple Gifts” a second time in 1950 in his first set of Old American Songs for voice and piano, which was later orchestrated. 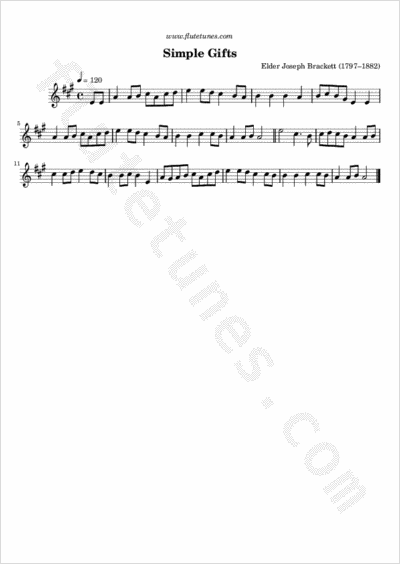 Many people thought that the tune of “Simple Gifts” was a traditional Celtic one but both the music and original lyrics are actually the compositions of Brackett. The song has since endured many inaccurate descriptions. Though often classified as an anonymous Shaker hymn or as a work song, it is better classified as a dance song, as the references to “turning” in the lyrics testify.